Whether you have newly installed porcelain or have had it for years, sealing your tile and grout lines is the most important step towards extending the life of your tiles. Porcelain can have a porous finish and if so, will absorb stains like a sponge. A little extra money spent sealing your tiles will resist stains and allow for easier maintenance on your part. 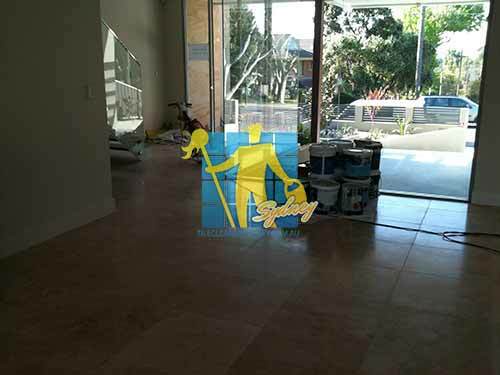 Tile Cleaners Sydney® has a team of technicians with the knowledge and experience to expertly protect your tiles. Don't just rely on regular cleaning to keep your tiles in the best condition. Contact Tile Cleaners Sydney® and talk to our specialists about the best sealing solutions for your porcelain tiles and grout. If you are considering installing new porcelain, Tile Cleaners Sydney® recommends a glazed tile. The reason is the tiles themselves simply don't require sealing, saving you money, time and energy on future maintenance, however if you already have unglazed porous porcelain tile we do recommend they be sealed with a quality sealer. Certain varieties of porcelain tile will require an impregnating sealer to fill the micro pores on the tile surface. 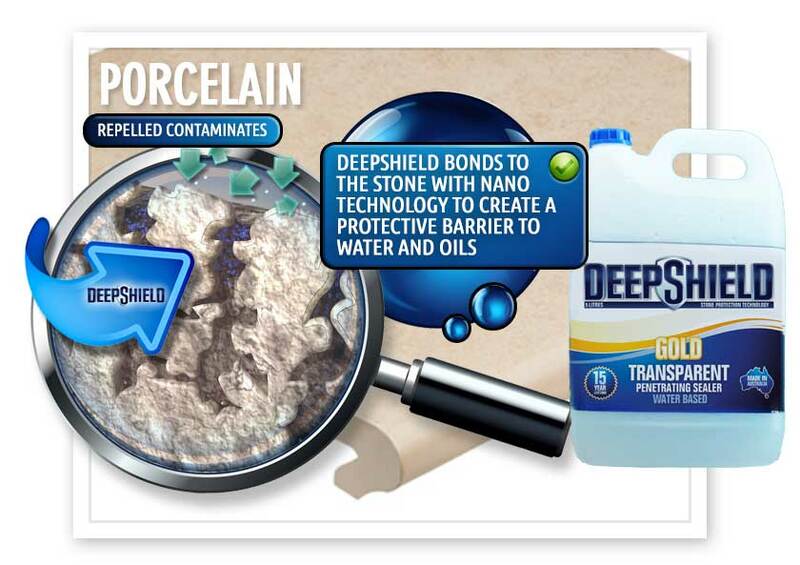 Australia's Deepshield™ Gold non-toxic sealer is specially designed to penetrate denser materials such as porcelain, ceramic, granite and marble, offering peace of mind by forming a barrier between the micro pores of your porcelain tiles and grout against potential water and oil based stains, while preserving the tile's appearance and resulting in maintenance becoming easier. 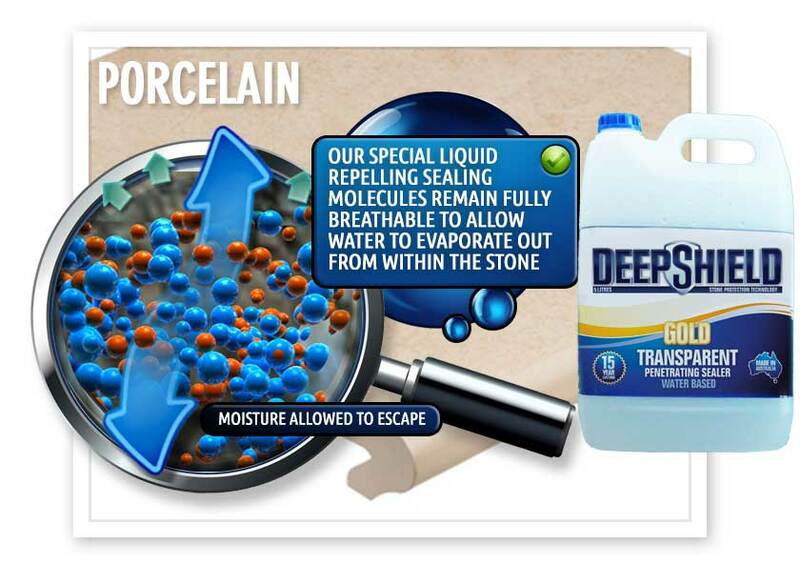 Deepshield™ Gold impregnating sealer performs well on porcelain and porcelain tiles and also provides excellent protection to the typically cement based grout lines. The first step in maintenance of porcelain tiles is the sealing of the tile (if porous) and the grout. Generally, glazed tile requires no sealer and some unglazed tile also requires no sealer. Know the type of tile you are installing. Test it with a small amount of water. If the surface darkens, it absorbs water and needs to be sealed. Generally, cementitious grout requires sealing while specialty grouts like epoxy and furans do not. If the grout darkens with water, it also needs a sealer. The use of sealers on tile is an area that books could be written about, with all the options available and their relations to each other. We speak only in very general terms and keep in mind; there are exceptions to every rule. Our technicians throughout are fully trained and experienced on using different types of sealers and will make sure your job is done professionally. Sealing is the final step in the process of ensuring your porcelain is in its best possible condition and the first step in ensuring your tiles and grout are protected for years to come. Tile Cleaners Sydney® will only carry out sealing once grout has fully cured on a newly laid floor, which can require up to 4 days. A professional clean will always be carried out before sealing no matter the age of your tile, newly laid or previously existing. A thorough clean allows for any debris to be removed as once a seal is applied anything remaining on the tile or grout will be locked in. Depending on the type of sealer and size of the area, the sealer will either be applied by a spray, a brush or a mop. Our technicians are trained in methodical techniques to make sure that all areas of the floors including the grout are covered evenly and thoroughly. It is important to make sure if you are purchasing a new floor that you understand the type of tile you are having laid. Apart from talking to the manufacturer, a basic water test can be carried out to know whether your porcelain needs sealing. Apply a few drops of water to the tile. If the water is absorbed after a few minutes or if it turns a darker colour your tiles will need sealing. It is rare that the grout lines wont need sealing but you can also carry out the same test to be sure. No matter what the tile, a grout seal is always recommended, as grout is an extremely porous combination of sand and cement. The type of sealer will depend on a few different things. 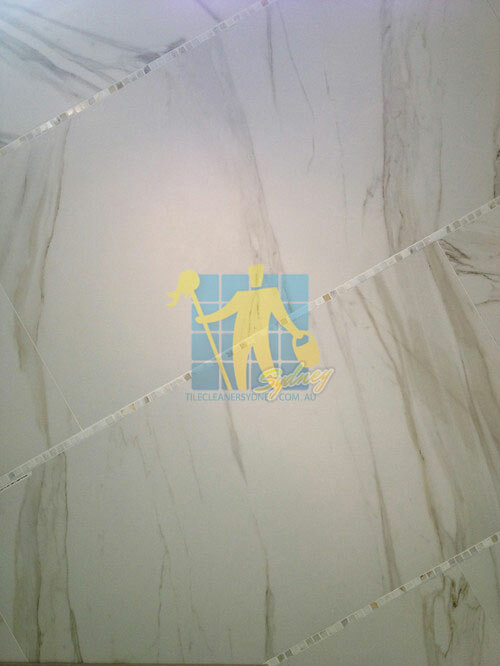 The type of porcelain tile, the traffic flow, whether it is internal or external and the finish you wish to achieve will affect the sealing product. 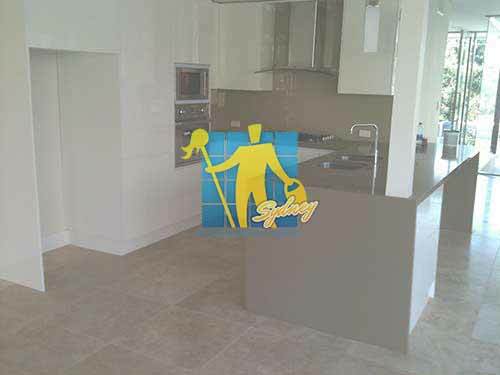 All of our sealers at Tile Cleaners Sydney® are non-toxic and eco-friendly. Impregnating Penetrating Sealer is highly recommended for many reasons both for indoor and outdoor porcelain tiles and grout. The sealer sits within the pores of the stone and grout providing protection for up to 15 years. 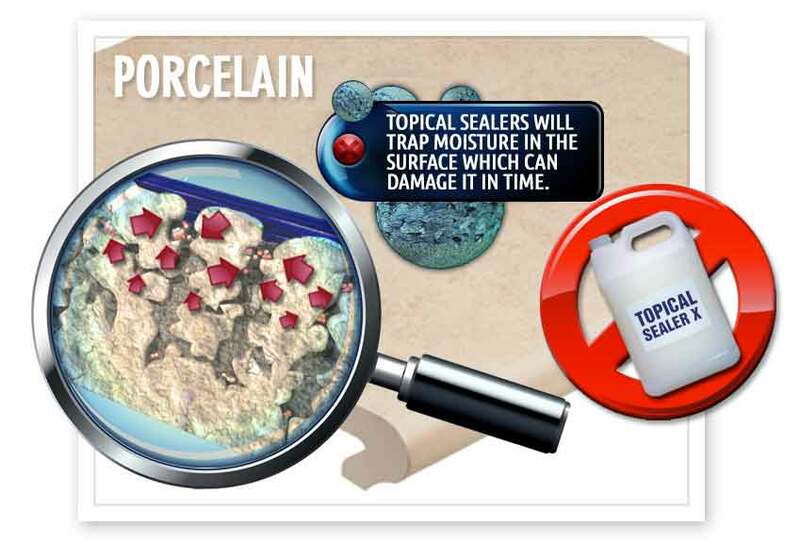 Topical based sealer provides a surface seal that will leave a more glossy finish to your porcelain. It has a shorter lifetime compared to an impregnating sealer of up to 3 years. Topical sealer should never be used on external pavers and are not recommended for grout lines. The sealer sits on the surface so when inevitable wear and tear occurs a flaking problem may arise. There are many options when it comes to sealing tiles and those options continue to grow. We try to keep it as simple and effective as possible as there will always be exceptions due to each tile and job being different. 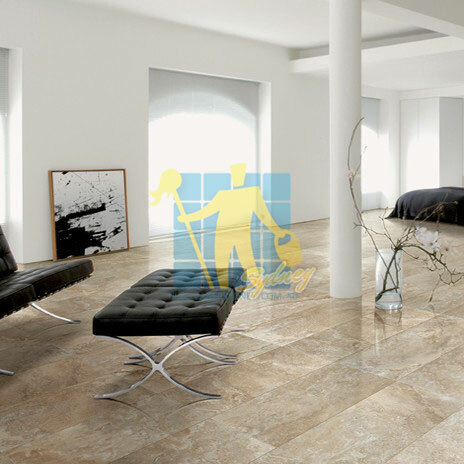 At Tile Cleaners Sydney® our experienced and friendly technicians are able to advise the very best sealer for your particular tiles and floors. Porcelain or ceramic tiles usually aren't a problem to keep clean, they are most often glazed and baked from the tile manufacturer and repel soil and stains extremely well. The problem, as we all know, IS the grout. And unfortunately most grout is not sealed, at all. Grout is an extremely porous sand based material that absorbs and holds stains easily. 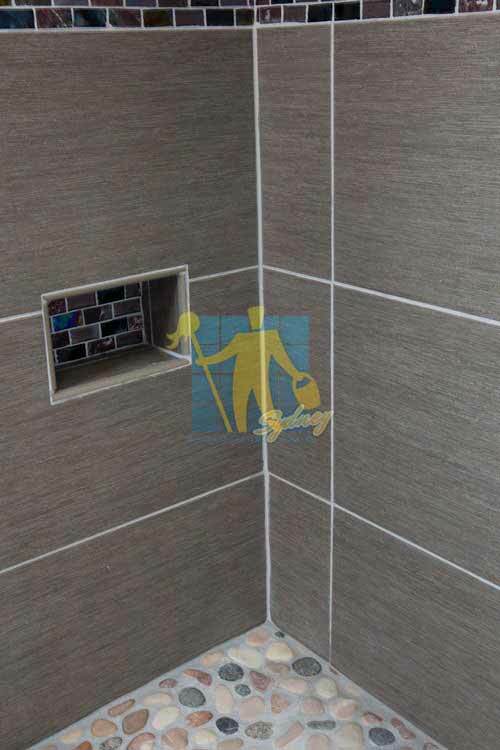 Just as tiles are sealed to protect them grout can also be sealed. Often if you have a ceramic or porcelain tile that doesn't need sealing you can overlook the need to seal the grout. However, for non-porous tiles, the grout tends to act as a magnet to any grime, dirt or mould. Mopping can just end up transferring grime into the porous grout. Sealing grout can also extend the life of your tiles as grout is the entry point for moisture that can lift tiles. Tile Cleaners Sydney® have specialised methods to successfully seal grout lines, either on their own or as part of an entire surface seal. We strongly recommend that any newly laid porous tiles and grout be sealed immediately so the area gains the full benefit of the protection. Tiling is not an inexpensive exercise, so why not protect your investment? Q: Why should I seal tiles & grout? Q: Can I seal just the grout lines if my tiles can not be sealed? Q: How often should i completely reseal my tiles? Q: How long does it take for the sealer to dry? 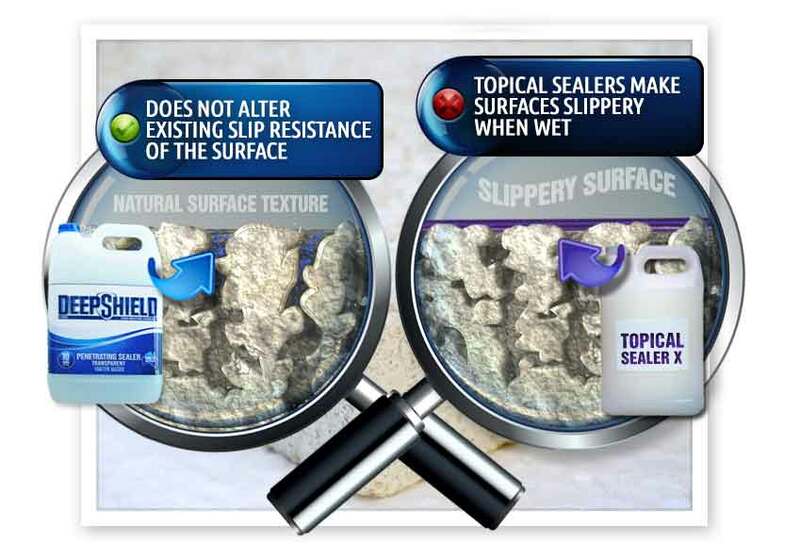 Q: Can penetrating sealers be applied over topical sealers? Q: How should I clean my sealed surface? Q: How do I know when my surface is ready for cleaning, stripping and resealing? Q: Is it safe to have my surfaces stripped and sealed? Q: Why do I need to strip my floors? Q: What is a strip and seal? Q: Which process can I expect when you arrive to seal my floors? Q: How often should I seal my floors? Q: What happens if I do not seal my floors? Q: When is the best time to seal my tiles, and how do I know that mine need sealing now? Q: Will sealing prevent efflorescence? Q: Efflorescence has built up on surfaces. Can you remove it? Q: What type of sealer should I use for my tiles? Q: How many of coats of sealer do you apply to my tiles? Q: Does sealing my tiles guarantee that they will stay stain free? Q: Does sealing tiles change the appearance of my surface? Q: Why should I organise a professional to seal my tiles? Q: Does sealing make my tiles or stone maintenance free? Q: How will you charge me for sealing my floors? Q: What should I do to prepare for my floor sealing?